An Australian native plant that is suited to shade and yet still has good flowers Bauera are a genus that grow naturally in cooler positions, mainly along the east coast from Tasmania to southern Queensland. They are variable in growth habit, generally reaching between .5 and 1.5m in height. Bauera rubioides (picture right) is one of the more commonly found of this species. Not widely available you will need to look in a specialist nursery for this one. This is a varied genus however growing conditions are similar. 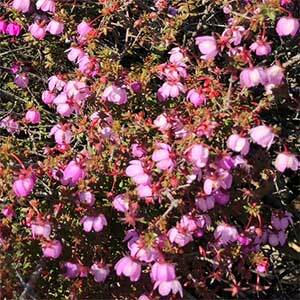 They are very useful for providing a flowering plant that will grow in moist soils in shade. In the garden they are best planted where they receive good moisture however with good drainage as well. A fertile soil similar to that found in rain forest areas and a position in dappled shade, or morning sun and then dappled shade. Pruning can be carried out if needed directly after flowering, always leaving good foliage growth below the cut. Bauera is a genus of only three species. All are small shrubs found in forests all along the Eastern Coastline of New South Wales and Southern Queensland and across Victoria. B. ruboides alba is referred to as the ‘White Dog Rose’. B. rubiodes var. microphylla has small leaves as its name suggests. Bauera capitata which is a lower growing species. Cuttings can be taken from mid spring through too late summer. A medium of vermiculate and washed river sand is suitable. You can also collect seeds, germination takes around 3 – 4 weeks if seed is fresh.